This is a PowerPoint I created as a little fun test/quiz to review the new vocabulary and phrases of the lesson "How was your weekend?" for grade 5. I like doing these activities as they are usually quiet and calm! Yay... and it is genuinely a good way to revise. I usually do them in part 2 or 3 of the lesson as part 1 is when we first go over the new vocab in their English notebooks , so this quiz is good to confirm what they learnt previously. 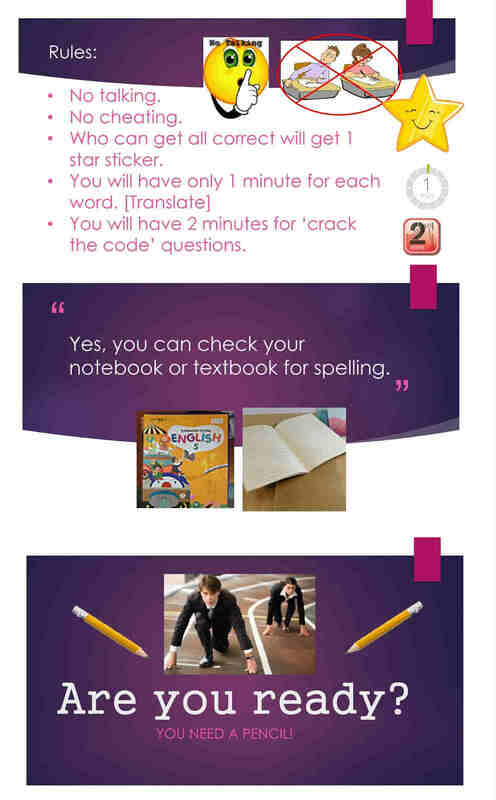 So, simple PowerPoint that you could use again for other lessons, just change the questions. I was able to get the Korean translations from the textbook. As you can see there are code questions and translate questions. You get them to try make the sentence to practice and you'll find that they'll quickly catch on how to write the sentence using the pictures. As you can see, I go over the rules carefully and this is good practice for in class tests for the end of the year as they tend to talk in tests and cheat - and I don't approve so I like to go over these rules each time I do an activity like this. The kids are very good at this, they get into the test zone but it's more fun as the code questions make it more interesting and I do a funny countdown at each also. It's also nice and quiet ! I award them with a star if they get them all correct and this means perfect answers - all spelling must be correct as well as they're allowed to check in their books. You could take out that slide and make them do this from memory but because this is supposed to be more of a review that's not too serious I allow them to look in their books. As you can see, the translations are straight forward. I hope this helps in your class. You can download the PowerPoint here, for free. 4. I went to a food festival. 7. I swam in the river. 11. I read many books. 13. I went camping with my family.